It all started with an invite, from someone outside of our usual circle. In trying to have my business be more connected, I joined some forums on the local happenings going on around the Seattle area that I might be able to participate in. Well Dave found me, from Oddmall, I received an email to be a vendor. I was so excited because my work is speaking for itself now, I love that this is taking on a life of it’s own. We enjoyed ourselves, Oddmall has everything handcrafted that you can imagine and somehow we fit right in. We had our booth all set up, I love hearing all of the oohs, and the it lights up. Yes most of my crowns light up and all of our wings as well. Two full days of selling my wearable art to fantastic individuals. I loved it, from the nervous beginning, all the way through the sad we already have to pack up. Two very special fairies known to the Seattle area are now owners of Frolicking Nymph creations. 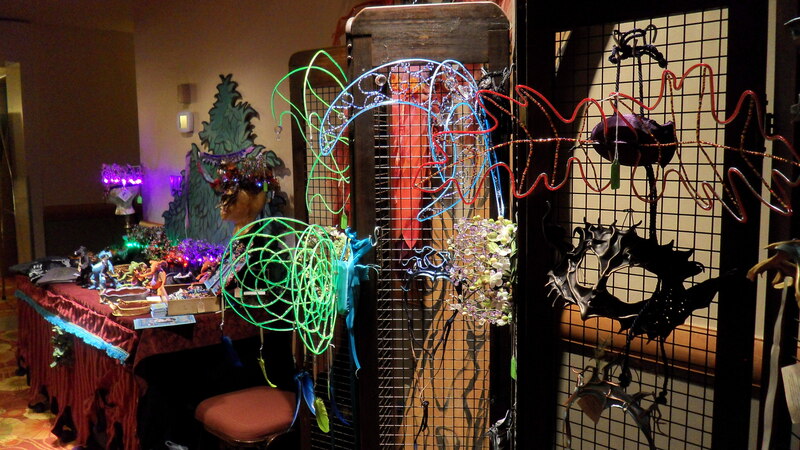 Thank you Fairy Princess Lolly and The Fremont Fairy for choosing my creations to help make your world more magical. We were also interviewed for a blog for Geek Radio. Also made some wonderful new connections and have some exciting new opportunities coming up. We had many inquiries about weddings, I had never even considered this an option but with what I make it does make some sense. So we are going to explore at least 1 wedding show this year to see how it all goes. We have a lot to look forward to, we will be vending at Oddmall this May/June in Everett. We are looking into several other events as well. As always we hope to see you and thank you for all of your support. I am so thankful for the success we are starting to see, the Faerie Worlds community show us so much love and support. It is always a win win getting to help Nymbol out with their table. FaerieCon West was our top seller so far, we are also vending at the Spring Fairy Festival this year, as well as looking into other events. I think it is time to spread my wings and see how everyone else feels about my work and what I do, I have great feeling about this. Thank you to the photographers for buying crowns to adorn little faerie heads for photo shoots. I look forward to seeing how this turns out. I have less than 30 day to replenish my stock, creativity is swirling about in my noggin so I better get busy. Fantastic story to share with you. I have been often asked how I decided to make my wings the way I do. My family and I attended Faerie Worlds for the first time in 2010, we had seen so many beautiful wings. Even though I liked them I still was wanting something that was my own, that stood out, and were original. Mind you so does everyone else. lol So I went to work, bare wire in hand, twisting, forming, coming up with my first pair. Man they were big and cumbersome. I was so excited, I wore them, was photographed, and very tired by the end of the night. However this sparked some serious creativity, since then, I have reworked the original pair, made other, lined a pair that a friend already had. I have also come up with new ideas and going into remodeling work to make them lighter and easier to wear. Now onto part two of the story.. We recently went on a family vacation, talking with friends, I discovered that I have done this before. What you say? Yes, when my husband and I were decorating the church at 3 AM the morning of our wedding 18 years ago. We were not allowed to tack anything into the wood and only allowed to use the hooks provided. I didn’t want a bare wall behind us while standing up before everyone. Not a lot of money, I had wire and Christmas light. I bent the wire, molded it with my hands, and lined two interconnected hearts with Christmas lights. These cute mini wings are so fun and they already have a home but I just wanted to share them with you. Well here at The Frolicking Nymph we have been hard at work. I have added new items to my Etsy, lots of pictures to view and if you fancy it you can buy it. 🙂 Two of my featured wings on there are the Crescent Moon Wings and the Red Oak Leaf Wings, seriously I feel the EL wire is an added bonus. I have a few smaller items on there for purchase if you aren’t into the larger items. I hope you enjoy them as much as I do. What a fantastic weekend here in Seattle, I got to vend at FaerieCon West. It was an incredible experience, I learned a lot and will use this knowledge to help my business to grow. I received so many compliments, got giddy at the sight of many a faerie adorned in my wears. My husband also has given me one of the best compliments ever in our 21 years together. He told me that my wings are pieces of art and that if I had enough of them that I could have my own showing in an art gallery. How sweet is that? 🙂 I wouldn’t go quite that far, I just enjoy how happy people are once they try something on and just love it enough to give it a new home. Thank you for all of the support, for the generosity from the Cass family, and thank you to my family for coming along with me on this amazing journey. See everyone at Faerie Worlds in Eugene, OR. July 26,27, and 28th 2013 you will find The Frolicking Nymph on Goblin Row in Neverworlds.